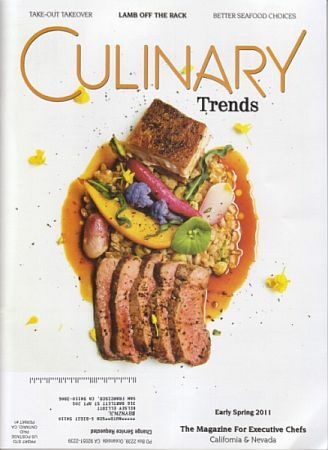 My first Culinary Trends article of 2011 has finally arrived! I chose to write about Sustainable Seafood for this issue, a more serious topic than my previous articles on flowers, eggs, and foraging. Because this is a very complex, difficult subject in nature, I took a more serious tone and included longer quotes from the experts that I interviewed. But don't worry, I still managed to throw in plenty of fishing/ocean/water puns! For hundreds of years the world has believed in the ocean’s limitless supply of seafood. So why now has the issue of sustainability come to the forefront? Chef Christian Graves of J-Six Restaurant in San Diego believes that it stems from an increased general awareness of where our food comes from. “People know where their wine is produced, where their vegetables come from, where their poultry and meat is raised. Fish are just the last stage of this movement.” But it’s more than just a desire to know where our food originates. Bluefin tuna, Chilean seabass, orange roughy; all of these fish are now on the verge of extinction. As Casson Trenor of San Francisco’s sustainable sushi restaurant Tataki notes, “It’s simply the desire to keep seafood around.” People are now realizing that, in fact, there are not plenty of other fish in the sea and that major changes must be made to preserve our seafood supply. Give someone a red-listed fish and they’ll eat for a day. Teach them to catch sustainable fish, and they’ll eat for a lifetime. Unfortunately, making the commitment to sustainable seafood is the easy part - it’s understanding the various factors that affect sustainability that is the real challenge. Chef Welch admits, “I’ve made tons of mistakes in the past, it takes a long time to really understand what’s good and what’s bad. It’s a constant learning experience.” While there are numerous factors that play into making a certain stock sustainable, Chef Welch primarily focuses on how it’s caught. “For me it’s method of catch. If you’re catching swordfish in a sustainable way, you’re harpooning them, you’re getting larger fish, 200-300 pounds, one at a time. But when you’re casting mile long hooks that catch 5-10 pound fish, you’re not even allowing them to prosper. Wild salmon is another example: when they’re trawl caught or hook caught and you’re not putting a net across a river bed, blocking them from going up the river to breed , you’re allowing them to reproduce.” However he notes that other aspects, such as the breed itself, are also very important. With so many factors playing into the idea of conscientious fishing, how can someone ever fully grasp the concept of sustainability? Luckily, there are more resources available to chefs than ever. The Monterey Bay Aquarium’s Seafood Watch is the most established source for US fishing, recommendations, as well as lists of restaurant and business partners across the country. Santa Monica Seafood is also an excellent source of information. Gleeson explains, “We hold sustainable seafood luncheons, where we invite 60 chefs to a top-rated restaurant in order to teach them. We bring in scientists from the Monterey Bay Aquarium to talk about the issues. We bring in suppliers like Loch Duart, one of the few fisheries doing farmed salmon in a conscientious manner. We bring in the fisherman or farmers to talk about what they’re doing. It’s an open forum for people to understand sustainability and see the importance of it. That’s why we educate, develop the website, and are constantly blogging on sustainable options. We’re trying to be the Wikipedia for the seafood industry.” With so much documentation, any chef feeling like a fish out of water can gain in-depth knowledge about all aspects of sustainability, including fishing and farming methods, seasonal and local stocks, overfishing, endangered species, by-catch, habitat damage, and industry management. However, this sort of policing is rare, and not every restaurant has the power to trace what they buy perfectly. Chef Rust and many other chefs insist that it is vital to have good relationships with farmers, fish mongers, and distributors. “For the most part I’m pretty close with the people I buy from, so if they tell me it’s a sustainable product, it’s going to be.” And, through all of the documentation, chefs can find other restaurants, distributors, and experts in the field who are equally committed to the cause and can begin forming relationships with like-minded industry professionals. Waterbar - Fun to Look at, Not as Fun to Eat at. A question that comes to mind relates to the influence American preferences and sensitivities have on the rest of the world, specifically, is an increased American awareness of harvest sustainability noticed/copied elsewhere about the planet? And this - I sat in a lecture last week on sustainability in urban planning. One of the speakers was a planner from San Diego. That 90% of their water is imported from the Sac Delta seems to fly in the face of his topic was apparently lost on him. But it made me smile.